Need a little assistance in calculating the correct number of refrigerant dehumidifiers for your water loss? A technically competent person can determine the best drying options with regard to load, performance of drying equipment and the ongoing monitoring of the drying envelope by using a psychrometric chart. The use of a thermal hygrometer will give readings of temperature in Celsius and Relative Humidity which allow the calculation of the Specific Humidity and then the total moisture load can be calculated using the equation below. The total moisture load can be divided by 24 to indicate the total airborne moisture available to be removed within an hour. Divide this by the collection rate of each different class of refrigerant dehumidifier and you will be able to assess how many dehumidifiers you need of each class to do the job. i) The Length, Width and Height of the area to be dried. iii) The Relative Humidity of the air to be dried (use a thermal hygrometer). Normally two to five air changes per hour (ACH) are recommended for water damage restoration applications. 1. Calculate the volume of the structure in cu. ft. (L x W x H). 2. Calculate the SCFM for one air change (volume / 60). 3. 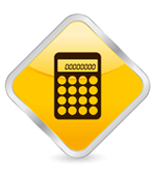 Calculate the dehumidification capacity required (SCFM x ACH). Example: A multi-story building measuring 100'L x 50'W x 50'H has received water damage due to flooding. You need to provide dehumidification capacity for three air changes per hour (ACH). 1. Volume = 100 x 50 x 50 = 250,000 cu. ft. This capacity could be provided using three 5,000-CFM dehumidifiers or one 15,000-CFM dehumidifier Use this same formula to calculate the capacity needed for other dehumidification applications in buildings by changing the ACH value.